DavLong’s online dashboard gives you access to the financial pulse of your practice from any Wi-Fi enabled device (computer, tablet, smartphone). Reports can be easily customized and saved in unlimited configurations for easy access. 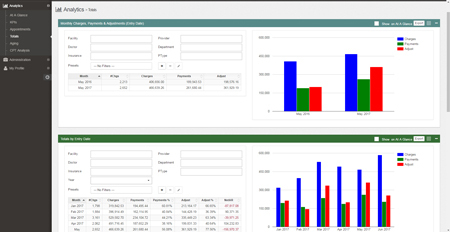 Categories for CPT Analysis, Accounts Receivable Aging, Financial Analysis, and Appointment Analysis are all tabulated with multiple widgets within each section. Personalized “At a Glance” page can be setup by each user based on their preferences. Key Performance Indicators (KPI) are also included with custom thresholds, settings and alerts can be assigned.